2015 Vauxhall Corsa 1.3 CDTi SRi review | What Car? The small hatchback segment is a particularly crowded arena, and Vauxhall has one of the best sellers in its range. Its Corsa has benefitted from a recent refresh, and we’re driving the diesel in manual guise with the more powerful 95bhp 1.3-litre engine. Diesel superminis make most sense if your driving includes lots of motorway miles, so this Corsa needs to be an appropriate town rambler as well as a confident motorway mile-cruncher. What is the 2015 Vauxhall Corsa 1.3 CDTi like to drive? The Corsa is a great car to navigate around town in. It’s economical, handles well, and the 'city' steering feature is a very useful addition that lightens the steering at the touch of a button. It’s helpful for tight manoeuvres and parking, as well as weaving in and out of congested areas. This SRi Corsa sits on 16in alloys, and speed bumps and road imperfections are absorbed well at lower speeds. The five-speed manual gearbox has a precise action, and the diesel engine has sufficient power for city use but it needs to be worked hard to make quick progress, and there’s some lag before the bulk of its torque kicks in at around 2000rpm. Like lots of diesel superminis in this class, the Corsa has low CO2 emissions, at 87g/km, and its claimed fuel economy of 85.6mpg makes the Corsa one of the more efficient cars in the class. On paper, then, engine efficiency is impressive and the diesel should cost peanuts to run. 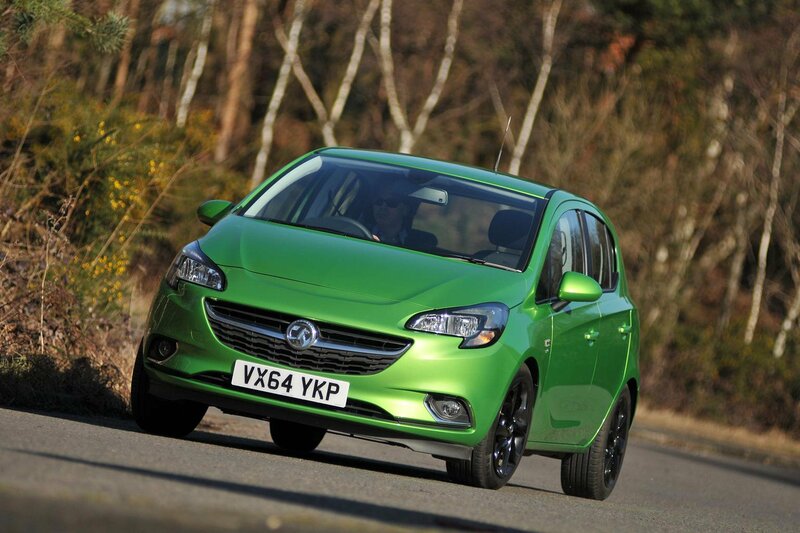 Indeed, our True MPG tests have found that this Corsa is capable of 60mpg - a fantastic result. Engine refinement, however, is disappointing. The noise from this more potent 95bhp 1.3-litre ecoFLEX diesel engine is considerable, sounding gruff from idle to higher speeds and, as such, you’ll rarely want to push it beyond 3500rpm. Vibrations are emitted through the cabin when cruising at 70mph, and wind noise is also noticeable. Road noise is well suppressed, though. What is the 2015 Vauxhall Corsa 1.3 CDTi like inside? We drove a Corsa in SRi trim, and that adds sports seats, cruise control and heated door mirrors to the generous list of standard equipment. The spacious cabin comes with a colour touchscreen – standard on Excite models and above – that’s easy to work your way around, but sits quite low on the dashboard, making it difficult to keep your eye on while on the move. The included apps - accessed by linking your smartphone to the infotainment system via Bluetooth - make up for the missing DAB radio and sat-nav. The materials around the dash are of reasonable quality, but feel a bit cheaper around the climate controls, while the steering wheel-mounted buttons that operate cruise control and radio functions are well placed and easy to use. There’s plenty of support from the sports seats that come with this trim level, and there’s plenty of space for the driver and front-seat passenger. It’s a little snug in the back with not a great deal of leg room, but it’ll just about accommodate two adults for short journeys. In the boot, there’s a fairly big drop from the lip so loading is a bit trickier than in some rivals – the Volkswagen Polo, for example, comes with a height-adjustable boot floor. The 285-litre capacity boot in the Corsa is a bit behind the Skoda Fabia’s 330 litres, but it’s still a well-sized effort that will cope fairly easily with everyday use. There’s no denying the Corsa’s excellent ability about town, but it’s hard to recommend this diesel version over the petrols in its range. This 1.3 is flexible, but unrefined. Its power will suit drivers who need their city car to occasionally cover motorway miles, but the gruff diesel tone will start to frustrate on longer journeys. However, if you do have your heart set on this version, then it’s available with discounts of around 10% via online broker sites.